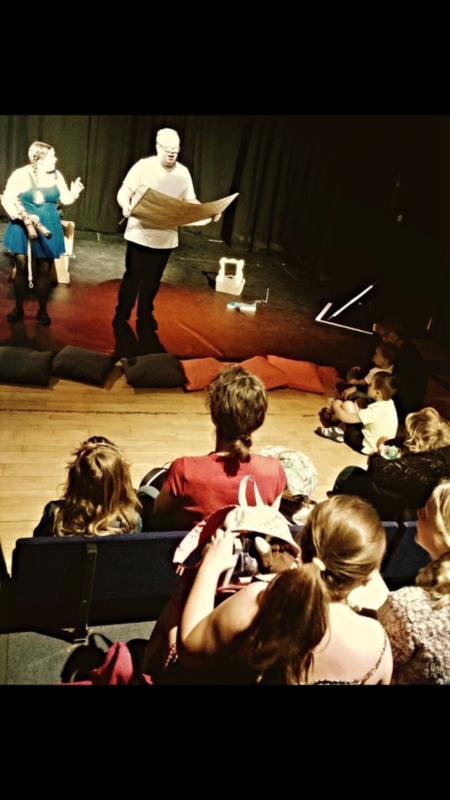 We’ve had a fantastic week in Barnstaple as part of the 10th Anniversary Fringe Theatre Fest. 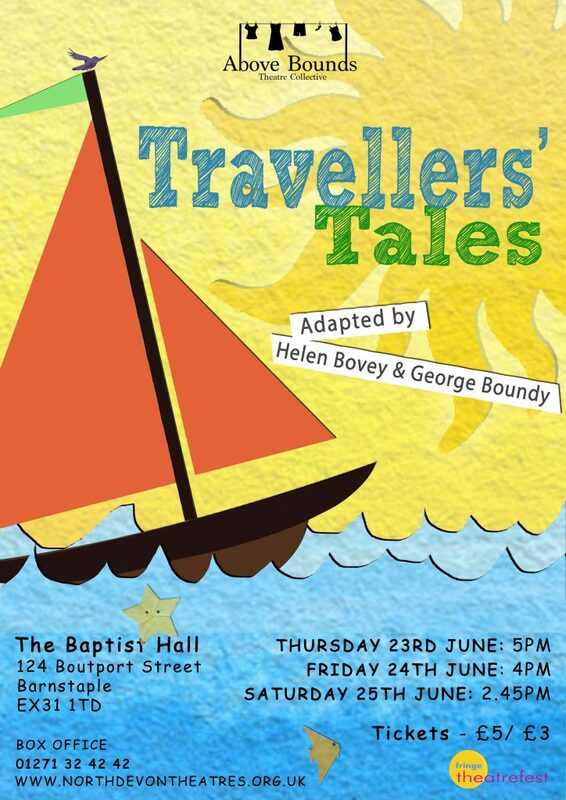 Traveller’s Tales played in the Baptist Hall for three performance and was well received by audiences young and old. Taking a train to India. Thanks to David T Green and Fringe Theatre Fest for this great photo. As is the way with festivals, we also managed to watch a number of productions from other companies, some based in Devon and others from around the country. Particular highlights have to be the darkly funny 9ft² from ‘A Hammier Basis,’ the insightful Lyrically Minded from ‘Mishmash Productions,’ and the zany rom-com What’s the Mater? A Comedy About Physics from, ‘The Last Baguette Theatre Company.’ Thanks to the charismatic and talented Bill Buffery and Gill Nathanson of ‘Multi Story Theatre Company,’ who organised the festival. Travellers’ Tales is having a rest for now but Above Bounds are still very much active. As our regular followers will know, we are soon going into Research and Development for The Ugly Ducking & Other Tales. If you want to stay up-to-date with our projects and performances, give us a like on Facebook and follow us on Twitter . Hope to catch Barnstaple again next year. Bon Voyage! It’s been just over a week since our last performance at the Plymouth Fringe Festival and what a festival it was! We had a brilliant turn out for both of our performances of Travellers’ Tales (we hope you enjoyed it if you came along) and we managed to watch lots of the other artists too. George managed to see over 20 other shows- so as you can imagine, it was a rather busy week for the both of us! 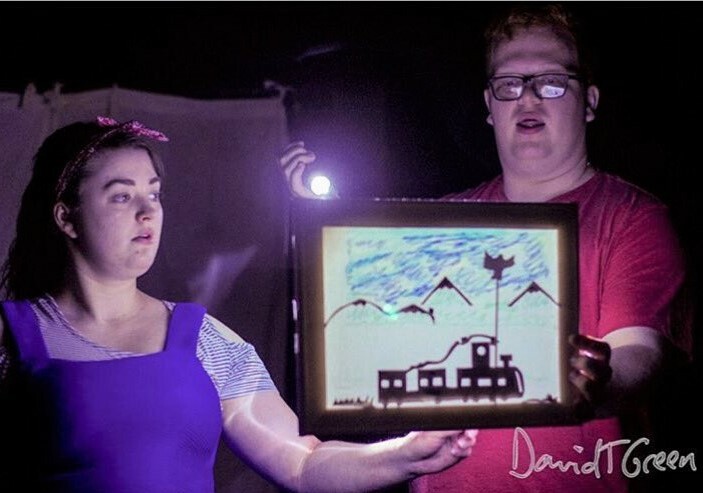 We were pleased with the positive responses we received to Travellers’ Tales, that the piece captured the playful style children have when playing together and created a nostalgic atmosphere. 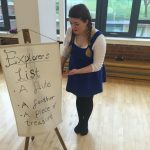 We were pleased that these things were discussed with us, as in our original artistic aims for Travellers’ Tales we discussed creating something that adults would enjoy just as much as children; a piece that was playful and left the audience with a smile on their face and a warm feeling. It was great to meet our audience after the shows during our ‘Meet the Characters’. This gave us the opportunity to speak directly to our target age range (3-7) and find out what sections of the piece they enjoyed the most. The puppets went down really well too and lots of children enjoyed the section where John and Sally visit India. I feel that this section is particularly enjoyable due to the supporting music, arranged by Alice Brown and written by George and I. This scene has a slower pace to both Egypt and the Caribbean, allowing the audience to really engage with the stories we are telling and the atmosphere we are creating. Our next stop is Barnstaple where we are performing at Fringe TheatreFest. Is there anything we are going to change before then? Well, not drastically, but we are going to have a look at introducing some comedy back into the Caribbean scene and play with the interactive elements of the performance. 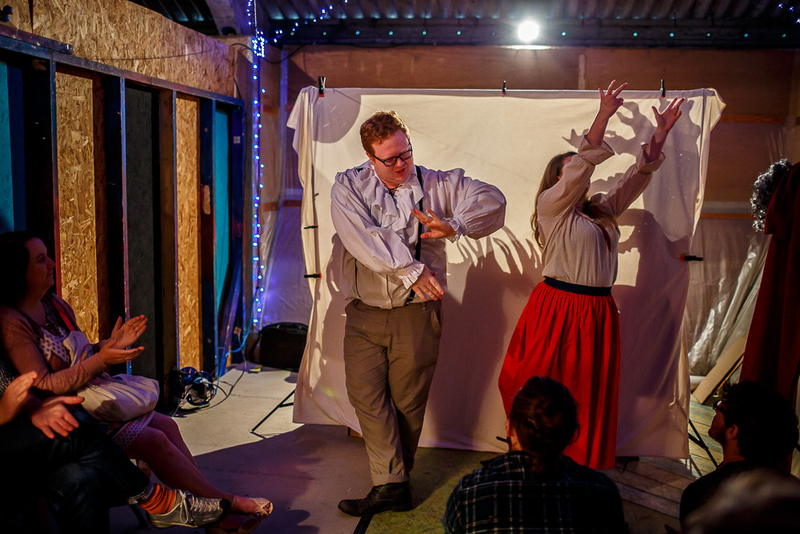 We are going to experiment with the characters of John and Sally and see where moments of silliness can be added back into the piece, amongst the moments of storytelling. We are also going to work on the mermaid story again and see if we can add in some bubbles, as well as another interactive moment with the audience. We have one more rehearsal day next Tuesday at TR2 in Plymouth before we head off to Barnstaple for Fringe TheatreFest, so we will keep you updated! We will also be doing some promotional 5 minute performances in Barnstaple in the lead up to our shows, so perhaps we will see you there? Thanks for reading and check back for further updates! We performed our first show of Travellers’ Tales as part of the Plymouth Fringe in The Barbican Theatre yesterday and it went down a storm! The children who watched the show really engaged with the story and the characters. We think a few of the adults in the audience might have had fun too. We have one show to go in Plymouth on Saturday, before the festival is over. In between our own work, we’ve managed to catch few other shows as well, and it’s shaping up to be a very eclectic, and high standard Fringe. Hope to see some of you in the audience on Saturday at 12:00pm. Tickets for Under 14s are £5! Book now. It’s the Week of the Plymouth Fringe! The final touches are being made to the puppets, and the costumes are ironed; that’s right, we’re ready to go! 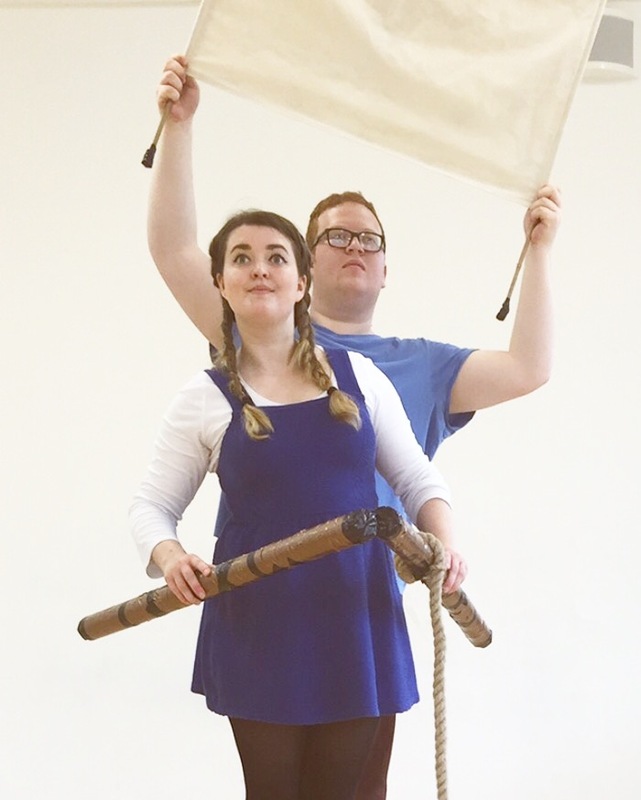 Time marches on fast, and with one final days rehearsal in TR2 (The Theatre Royal Plymouth’s second space) we are all set to perform Travellers’ Tales this Tuesday at 12.30pm. First stop, is our technical rehearsal this afternoon where we’re working with local theatre students Noah Jones and Julia Froud. We’ve been in touch with Noah and Julia throughout the rehearsal process so that they could design the lighting and programme our sound cues. This has been rather exciting for us to witness as we don’t normally work with a technical team whilst devising a show. Noah came and watched a run through of our show last week and it was good to know that we were all on the same page… this one! We’re thrilled to share the bill with so many other exciting and interesting shows and this looks to be an enjoyable and insightful festival. We’re itching to get started, and will be updating you all on how the week goes via twitter and facebook, give us a follow @abovebounds and hope to see some you are our performances this week. Under 14s get £5 tickets! 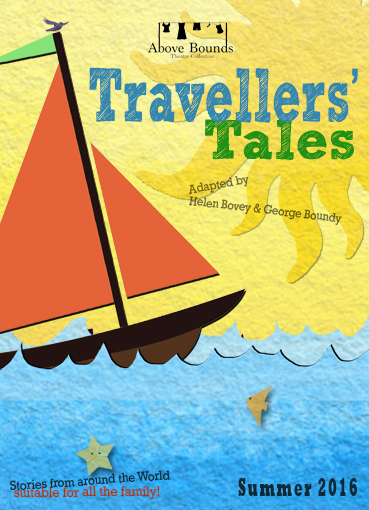 I’ve just come back from a week in Birmingham working with George to re-develop the script for Travellers’ Tales. 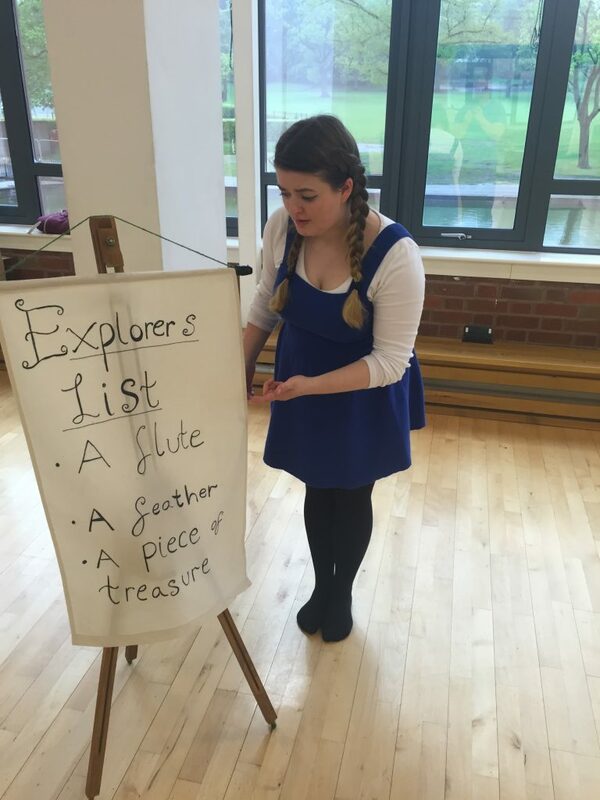 We first performed Travellers’ Tales last year at Brixfest before taking it to some schools in Exeter, Devon. 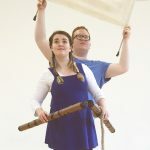 The piece is a light-hearted comedy for children aged 3-7 and their families, taking the audience on a journey with John and Sally, two hopeless explorers, as they search for a flute, a feather and a piece of treasure. 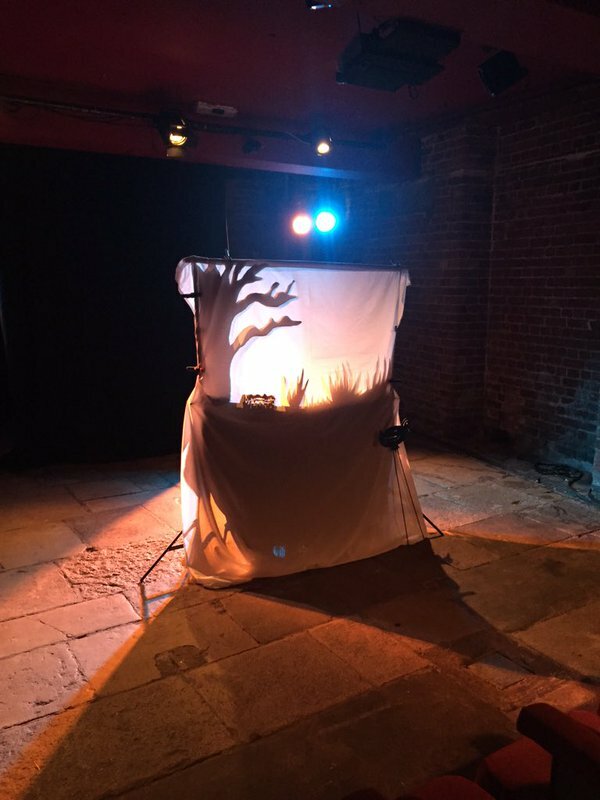 Having worked without dialogue during our development of Portrait for the Rooted Moon International Theatre festival in 2015, we wanted to simplify the script for Travellers’ Tales and apply some of the techniques we had developed. The piece is aimed at children and throughout our process, we work with our audience in mind. Over the week, we experimented with sound and music, developing sound for each of the new locations John and Sally visit. This was inspired by a fabulous workshop with Verity Standen that I took part in at the Bike Shed Theatre last weekend, working with voice and music. As John and Sally travel the world, I thought that we could use sound to our advantage and certainly our explorations were fruitful. We also played with the use of rhyme in the script, when to use it and when to not. I’m really looking forward to getting the script back on it’s feet in early April and seeing how sound works practically in the performance. 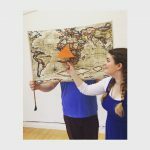 Travellers’ Tales will be performed at Fringe TheatreFest in Barnstaple this Summer, as well as at other fringe festivals in the South West. We are currently taking bookings for KS1 schools performances, so please do get in touch if you’d like us to visit your school in the Summer Term and I can send through the production information. I am also still planning for our development of ‘The Ugly Duckling & Other Tales’ and am currently in the process of sending off applications for our development later in the year.